(CNN) -- The space shuttle Discovery is on pace for a Sunday launch after NASA engineers repaired a leaky gas venting system, officials said Saturday. 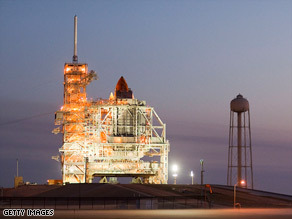 Space shuttle Discovery readies for launch, which now appears on pace for Sunday. The leak had canceled a planned launch on Wednesday. NASA hopes the seven-member crew can take off around 7:40 p.m. Sunday on a mission to the international space station, where they will deliver supplies needed to expand the station's crew to six people. "The vehicle is looking real good ... ," lead shuttle flight director Mike Moses said. "Basically, I think I can sum this up by just saying we're good to go tomorrow and we're looking forward to getting the count going." A leak in a hydrogen gas vent line forced Wednesday's delay. Repairs went smoothly, Moses said. The line funnels flammable hydrogen away from the launch pad during takeoff. The shuttle crew will be delivering the final parts needed for an expanded solar energy power system that will allow the station to double its crew to six people. The crew also will be dropping off Japanese astronaut Koichi Wakata, who will replace NASA's Sandy Magnus on the space station. Kathy Winters, the mission's chief weather officer, said Sunday appears to offer only a 20 percent chance of weather that would scrub the launch. The crew, led by commander Lee Archambault, is expected to board Discovery at Kennedy Space Center at Cape Canaveral, Florida, at about 4:30 p.m. Sunday. Officials said the crew has been training and resting for the mission since Wednesday. Earlier this week, Magnus, station commander Michael Fincke and Russian engineer Yury Lonchakov had to take shelter in their Soyuz spacecraft -- a lifeboat of sorts -- when a piece of debris from an earlier mission hurtled uncomfortably close to the station. Wednesday's launch postponement was the latest in a series of delays for Discovery as it tries to make the 28th shuttle mission to the space station. The launch had been delayed previously to allow time to check a "flow-control valve in the shuttle's main engines," NASA said last week. That resulted from damage being found in a valve on the shuttle Endeavour during its November 2008 flight. Three valves were cleared and installed on Discovery, it said. CNN's Kim Segal and John Zarella contributed to this report.